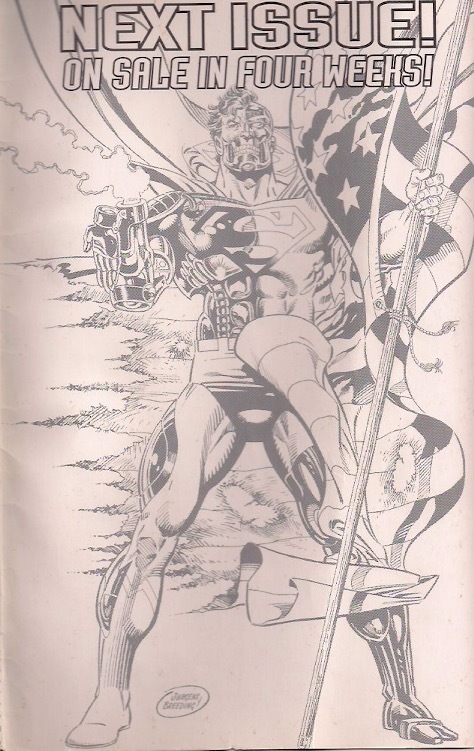 Ah, the Cyborg Superman, the replacement Superman that turned out to be a villain. This Superman claimed to be the reconstructed Superman, rebuilt and better than ever. In this issue, he ties the body of Doomsday to a meteor and hurls him into space. Later in the storyline, Cyborg Superman reveals himself to be Hank Henshaw, an astronaut who believes that Superman was responsible for the irradiation of his ship and his crew. Now he rebuilt himself in Superman’s image in a plot to ruin his name! Lois Lane is chasing down leads on the Supermen sightings. She arrives at a Lexcorp facility where a nuclear scientist claims that Superman picked up a cracked nuclear waste container and flew off with it. Lois is skeptical until she she sees a picture. The Mayor of Metropolis is visiting S.T.A.R. Labs and is barged in on by Superman. Is that Jimmy with G. Gordon Liddy? Stuck in traffic on her way back from Lexcorp, Lois hears that the Mayor claims that Superman just left the labs. She calls Jimmy at the Planet and confirms that Superman’s body is missing. Moments later, Cadmus is under siege. Their defenses are shredded immediately. Finally a new Superman, a cyborg, appears at the door and demands that Guardian take him to Doomsday. "Your clothes, your boots, your Doomsday, give them to me now!" Guardian doubts the Superman’s claims, and refuses to give him information other than that Doomsday has not moved since the battle. Superman uses his powers to find the his captive enemy and uses his robotic arm to enter the cell. "My CPU, is neuronet processor, a learning computer"
Despite the protests of Cadmus’ head, he takes the body, flying off into space. He straps the body to an asteroid and tosses it away from Earth. Part of me wishes he was tossed into the Phantom Zone. He meets up with Lois and tells her that his memory is gone but he is Superman. He's pulling a Long Island Medium on her. He remembers little bits like a farm in Kansas and that Lois named him. Lois starts to believe. She takes him to Professor Hamilton for tests and learns that the flesh part of the cyborg is Superman. In the depths of outer space, as Doomsday hurtles through the solar system Doomsday laughs. At least the Jurgens acknowledges that you can't hear laughter in space. I used to want to order everything off these Mile High ads. This was never my favorite issue of the four new Supermen and it still isn’t. It’s an introductory issue for the character and I don’t feel like we learn an awful lot about the Cyborg compared to Steel or Superboy. He shows up tosses Doomsday, confronts Lois and gets tested, that’s it. I did like how the Superman was slowly revealed. He was shadowed for the first half of the issue created suspense, what we see looks like the Superman we know. This would have been better if he hadn’t been revealed in the final pages of Adventures of Superman #500 and the cover of this very issue! The tossing of Doomsday into space reminds me of the Superman films and the Phantom Zone where Jor-El hurls Zod and his cronies into space but the way that the Cyborg Superman acts is straight of the "The Terminator." He acts with robotic, with a singular mission and will battle through anything to get it just like the T-800 in the search for Sarah Connor. His T-800-like obsession actually echoes the last words of Superman, asking Lois about Doomsday. It makes sense that if Superman came back with little memory that his first order of business would be to rid the world of Doomsday once and for all. Henshaw was very good at establishing trust. This book also seems to set up a round two between Superman and Doomsday, but this Superman never takes on Doomsday in the storyline. When the real Superman does return he takes on Doomsday in Superman/Doomsday: Hunter/Prey which doesn’t happen for another year. This book is only good if you’re going to get the entire “Reign of the Supermen” story because it doesn’t have much of an impact outside of this particular storyline. We've got a good creative team next week! Since Dr. Strange is the number one movie in the country, we're going to look at the one Dr. Strange story in my collection. Spider-Man teams with Dr. Strange to take on Dr. Doom in "Vishanti" by Denny O'Neil & Frank Miller! This story is taken from one of my first Trade Paperbacks, The Sensational Spider-Man! See you next week. Did the inside back cover this week, since all of the new Supermen books have the same back cover.